The Pediatric Hearing Device Program at Camino ENT works with leading hearing device manufacturers on the market to provide comprehensive fitting and programming services for children and their families. Once hearing loss has been diagnosed, a hearing device consultation is scheduled. This appointment is scheduled for one hour. At the consultation, the audiologist will explain in more depth about the child’s hearing loss and how the hearing loss could potentially affect speech and language learning. The audiologist will make a recommendation for a hearing device and will help the family make the right decision. Hearing devices can be purchased from many different manufacturers. At Camino ENT, the audiologist works with leading manufacturers to offer patients a wide variety of device styles and technologies. The audiologist will explain the different levels of technology (basic, mid-range and high-end), along with which style of hearing device is appropriate for the patient’s hearing loss. Hearing devices are an investment – the audiologist and family will discuss the different price points so that the family is aware of the final cost. If the child’s hearing device requires a custom ear mold, the audiologist will check the ear for cerumen (earwax) and then proceed with taking an impression of the ear(s). An impression is taken by inserting a small piece of foam into the ear canal and then filling the outer part of the ear canal with a silicone-based material. This material takes several minutes to harden, during which time the child can be active (without touching the ear). Once the material is hard, the impression(s) are sent to the manufacturer for the mold or device to be formed. As a child grows, the ear will also change in size and shape. Ear molds will need to be replaced more often for children as they grow, sometimes every couple months. The audiologist will explain what changes to look for so that parents know when it might be time for a new set of ear molds to be made. Once the family has chosen a device, a fitting appointment will be scheduled. This appointment should take place two weeks after the consultation. At the fitting appointment, the audiologist will enter the child’s hearing loss information into the computer and make initial programming changes to the hearing device(s). In some cases, behavioral threshold testing may not provide accurate or reliable results for the audiologist to use in programming the hearing device. The audiologist may need to rely on other types of testing to estimate the child’s hearing loss. These additional tests are called electroacoustical and includes auditory brainstem response (ABR) and auditory steady-state response (ASSR) testing. Even with behavioral or electroacoustical thresholds, the audiologist still needs to account for the smaller size of a young child’s ear canal when fitting a hearing device. A real-ear measurement will be taken to account for the smaller ear canal to ensure the programming is accurate based on the child’s canal. This measurement is used to obtain frequency and intensity information about how amplification (called gain) is being transmitted through the child’s ear. 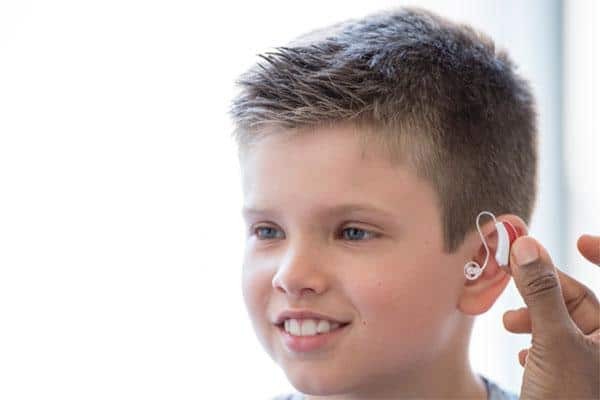 The audiologist will explain the main parts of the hearing device to the family and will have the parents/guardians practice inserting and removing the device. The audiologist will also give the family tools to clean the device and show the family how to do a listening check with the child each morning. In the state of California, all hearing devices have a 45-day trial period. If the family decides at the end of the trial period to return the hearing devices, the cost of the device(s) will be returned to the patient in full. Any insurance benefit or contribution applied to the device(s) will be taken into account when calculating the reimbursement. Once the child is fit with the hearing device(s), the audiologist will schedule the follow-up appointments. Programming changes to volume and sound quality will be administered as the child adjusts to wearing the device over time. A hearing test will also be completed in the sound booth, to determine whether the hearing devices are giving the child adequate access to soft speech sounds. Once the programming is optimized for the child, it is recommended that the family return every six months for a device check and testing. Hearing device services such as cleaning, troubleshooting and programming, are included at no cost during the warranty of the device(s).